Arched windows, interior and exterior columns, and brick veneer give this four bedroom traditional home instant authority. An arched clerestory window channels light from the foyer to the great room. Graceful columns punctuate the open interior that connects the foyer, great room, kitchen, and sun room. Special ceiling treatments and skylights add volume throughout the home. 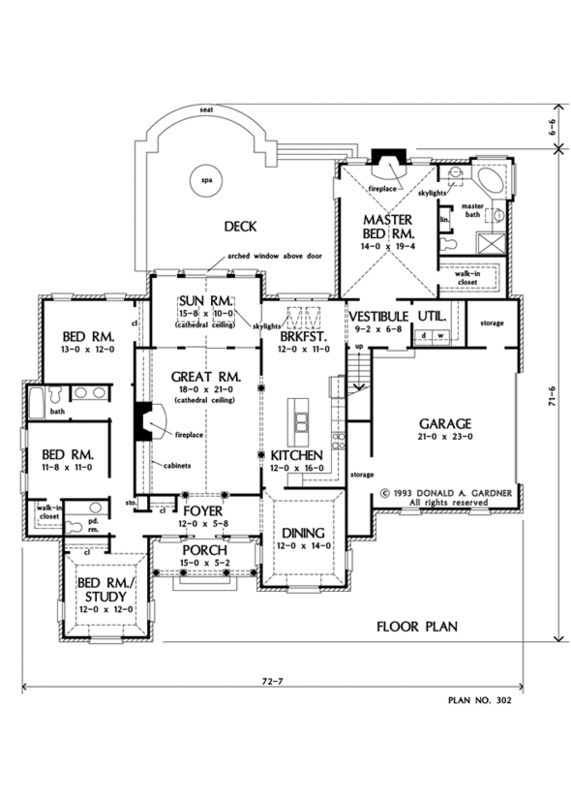 The master suite with fireplace, garden tub, separate shower, and separate vanities, accesses the deck with optional spa. The skylit bonus room makes a great play area for kids and provides easy access to attic storage. 1st Floor: 2663 Sq. Ft. 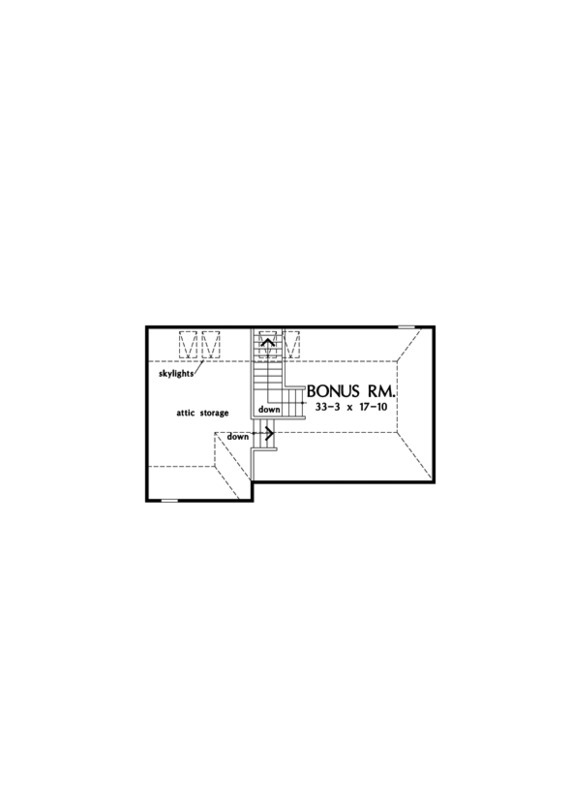 Bonus Room: 653 Sq. 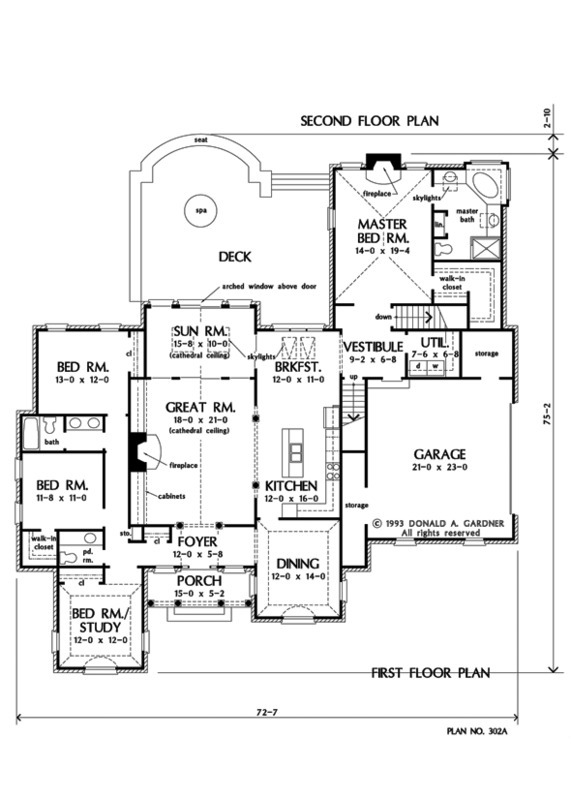 Ft.
House Dimensions: 72' 7" x 71' 5"
Master Bedroom: 14' 0" x 19' 4"
Foyer (Vaulted): 12' 0" x 5' 8" x 20' 0"
Dining Room (Tray): 12' 0" x 14' 0" x 11' 0"
Great Room (Cathedral): 18' 0" x 21' 0" x 18' 0"
Kitchen : 12' 0" x 16' 0" x 9' 4"
Breakfast Room : 12' 0" x 11' 0" x 9' 4"
Utility Room : 7' 4" x 6' 8" x 9' 4"
Bonus Room (Vaulted): 33' 3" x 17' 10" x 8' 0"
Garage : 21' 0" x 23' 0" x 0' 0"
Garage Storage : 7' 5" x 6' 8" x 0' 0"
Master Bedroom (Vaulted): 14' 0" x 19' 4" x 14' 6"
Bedroom / Study (Tray): 12' 0" x 12' 0" x 11' 0"
Bedroom #3 : 13' 0" x 12' 0" x 9' 4"
Bedroom #4 : 11' 8" x 11' 0" x 9' 4"
Porch - Front : 14' 10" x 5' 2" x 0' 0"
Deck / Patio : 17' 4" x 18' 10" x 0' 0"
Storage (Other) : 3' 4" x 16' 4" x 0' 0"
Other (Cathedral): 15' 8" x 10' 0" x 18' 0"
Other #2 : 9' 2" x 6' 8" x 9' 4"